Trophy Run visitors who purchased a vacation package from TakeMe2Branson.com will receive accommodations in an affiliated hotels upon package date confirmation. Before you can reserve any of these hotels, you’ll need to confirm your travel dates, as hotel availability is subject to availability. Call TakeMe2Branson at 1-844-538-2413 to book your reservation today! Ask for upgrades to a cabin or condo, extra nights, and/or additional entertainment and dining credit. 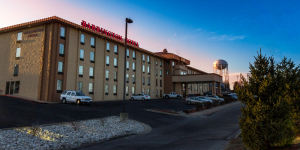 The Barrington Hotel & Suites is located just off the Shepherd of the Hills Expressway, near the The Mansion Theatre, Sight & Sound Theatre and The Shoppes at Branson Meadow. We are minutes from the world famous 76 Country Music Boulevard and the Branson Landing, yet nestled in quite comfort within the serenity of the Ozark Hills. The recently renovated Barrington Hotel is a tribute to both style and beauty. Our majestic stone fireplace and hardwood floors grace our beautiful entryway which leads to 145 spacious luxury rooms. Our spacious King Jacuzzi, Honeymoon, and Presidential Suites create a cozy atmosphere for relaxation with a marble in room Jacuzzi tub and comfortable sitting area. Come and stay at The Barrington Hotel & Suites where we offer our guests the luxury of a quiet location at affordable rates in the Ozark Hills, minutes away from the world famous 76 Country Music Boulevard. Here at The Stone Castle Hotel & Conference Center, we are committed to providing superb customer service and legendary hospitality. Our reasonable rates and impressive list of amenities assures you the best choice when you bring your group, conference, or special event to Branson. We are conveniently located on Green Mountain Drive near Hwy. 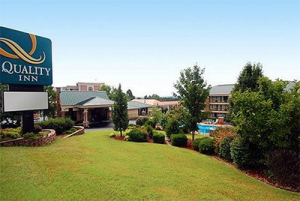 165 with easy access to Branson’s shows, attractions, shopping and dining! 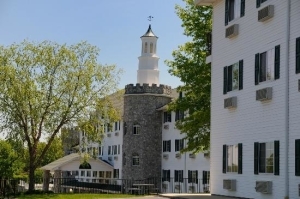 The Stone Castle Hotel & Conference Center has two indoor heated pools and hot tubs. Pool towels and chairs are provided for your convenience. The pool hours are from 6:00 a.m. to 1:00 a.m. The Classic Motor Inn is a family owned and operated Branson hotel that is conveniently located on Shepherd of the Hills Expressway so we have easy access to all of the best Branson attractions. Opened in 1993 by the Carter family, the tradition continues with the Morin family. 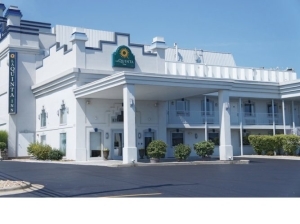 The Classic Motor Inn is Branson’s premiere hotel for the classic car enthusiast. A clean, comfortable, family atmosphere make the Classic Motor Inn the hotel you will return to again, and again, while staying in Branson Missouri. 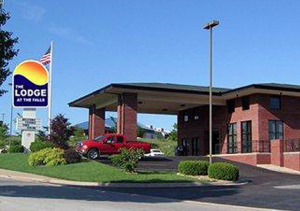 Classic Motor Inn offers convenient access to all of Branson’s top-rated shows and attractions. Pierce Arrow, Shoji Tabuchi, The Imax Complex, Hamner Theatre, and the Sight and Sound Theatre are all within a mile of the motel. Nearby dining includes Golden Corral, Red Lobster, Cracker Barrel, Olive Garden and BT Bones Steak House. Shopping and attractions are only minutes away. 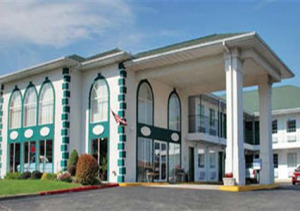 Classic Motor Inn has a long history of providing clean, comfortable rooms and friendly service at an affordable price. One stay with us and you’ll see why Classic Motor Inn is the motel guests return to time and time again! These Premium Lodging Upgrades are available as an upgrade option for most packages. 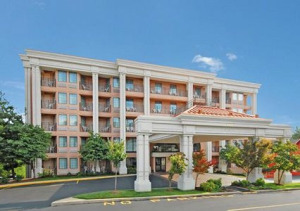 All Thousand Hills condos provide quality resort amenities with ultimate guest comfort as the goal. Indoor and outdoor swimming pools, Jacuzzi tubs perfect for relaxation, and a fully-equipped fitness center work together to make our hotel and golf resort the best place to stay in Branson. Add in our spacious meeting rooms and we become the first choice for groups, family events, or quiet getaways in Branson, Missouri. 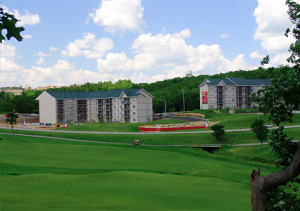 Our Branson condos are also located around our award winning 18 Hole Golf Course. Thousand Hills Branson Golf Course was recently voted “Best of the Ozarks” by the readers of the Springfield News Leader. Golf enthusiasts will certainly enjoy our GPS equipped golf carts, and the largest pro shop in Branson, MO offering shoes, shirts, equipment, gifts and souvenirs. Visit our golf section and make your Branson tee time online to see why Thousand Hills Golf Course is the #1 golf course in Branson. While staying at Thousand Hills Hotel & Golf Resort you will be close to the biggest and best Branson, Missouri attractions. White Water, Dixie Stampede, The Titanic Museum, and the area’s largest discount mall, Tanger Outlet Mall are within walking distance of most of our Branson Lodging choices. Theaters such as the new Sight and Sound and The White House are located on side roads of the resort and will provide hassle-free traffic routes to most venues. The peaceful serenity of the private Branson cabin rentals offered by Thousand Hills Golf Resort in the Cabins at Grand Mountain is a rare blending in superb location; uniquely found in Branson MO. Immerse yourself in this secluded White River country, imagining the trickling stream quietly moving past below your Branson rental cabin, with the gentle fresh mountain air caressing your face. Within seconds of America’s most popular vacation destination, you will feel transported to miles away from civilization. It is literally just a couple of minutes to be on Country Music Boulevard (aka “The Strip”, Missouri Highway 76) enroute to enjoy a favorite live show such as Andy Williams, Shoji Tabuchi, Noah at Sight and Sound, the Presleys’ or one of any of the over 150 live shows presented in Branson, Missouri. 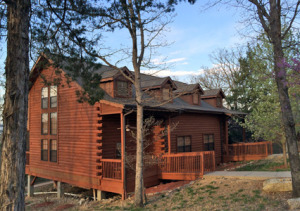 At our Branson Premier Cabin Rental Accommodations you will find a Reasonably Priced Top of the Line Combination not found elsewhere. Each cabin rental will include a jetted tub, fireplace, fully-equipped kitchen, complimentary wi-fi, and a screened back porch. Enjoy a wealth of amenities at an affordable price when choosing the Clarion Hotel® in Branson, MO. We are conveniently located in the heart of the city, within walking distance from many popular live entertainment venues. Our hotel has ample free parking that can accommodate most vehicles, and features laundry facilities on the property that are available for use at your convenience. The Branson, MO Quality Inn On the Strip hotel is on The Strip, across the street from the Baldknobbers Jamboree Show. We are minutes from Silver Dollar City amusement park, White Water water park, 76 Music Hall, Dixie Stampede, Shoji Tabuchi Theatre, Ripley’s Believe it or Not and four top-rated golf courses. We offer discount ticketing for most attractions. Shopping and dining options are all over the area. Enjoy free coffee while reading your free daily newspaper. We have a guest-use computer, printer and copy and fax machines. All our rooms have coffee makers, irons, ironing boards, hairdryers and cable television. Non-smoking rooms are available. The La Quinta Inn Branson On the Strip offers an unprecedented blend of amenities to make your time in Branson truly memorable. Stay in one of their spacious rooms and enjoy a Free Bright Side Breakfast®. Featuring level parking, elevators, indoor pool, spa, sauna, fitness center, meeting rooms, the Music city Centre Theatre, a beauty salon, boutique & a Starbucks coffee shop all on the same premises. Among the most popular hotels in Branson, the Grand Oaks Hotel stands out with a higher standard of hospitality. Enjoy a level of service, amenities and appearance associated with upscale hotels at an affordable price. The Grand Oaks Hotel in Branson, MO is a refreshing departure from the typical motel room, with a variety of accommodations, located minutes away from Branson’s most exciting attractions. We are committed to meeting the needs of all who enter our doors with friendly, professional service and stylish guest accommodations that are warmly appointed. 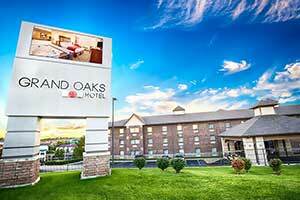 The Grand Oaks Hotels is a short distance from many of Branson’s most popular attractions. Shorty Smalls Restaurant, formerly Andy Williams Moon River Grill, is within walking distance from the Grand Oaks and across the street from the Branson Variety Theatre. Branson’s best known golf course Thousand Hills is just around the corner from the hotel. Some of Branson’s best dining options are also a short distance from the hotel like Lonestar Steakhouse, Panera Bread, and Florentina’s Italian Restaurant. Start your day right with our Hot Breakfast! Fresh pancakes, hot and cold cereals, fruit, breads, juice, coffee, hot tea, and milk are served daily. Hot items are served on a daily rotating schedule and include either Country Gravy and Biscuits or Scrambled Eggs and Sausage! Breakfast items are subject to change.